Rich, deep and red. 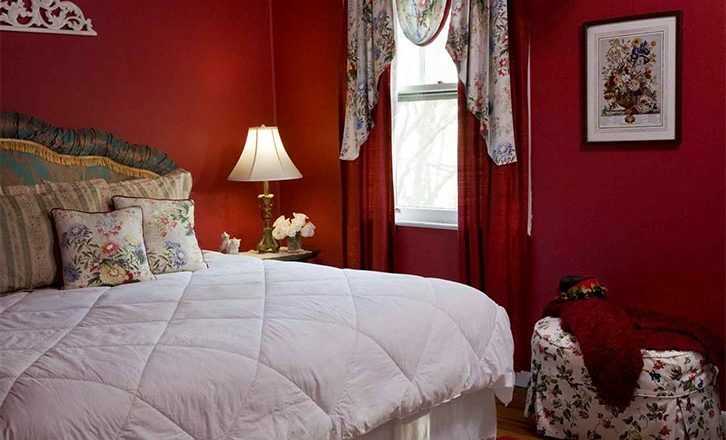 This dramatic room has a king bed, featuring a down comforter and vintage throw pillows. Also an HD television featuring hundreds of Time Warner channels. 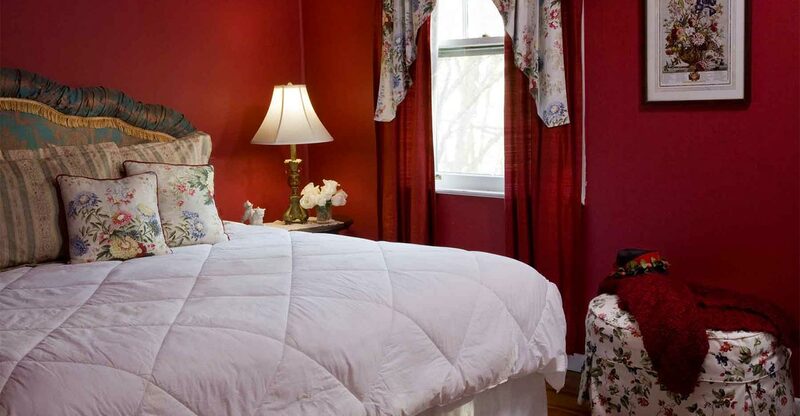 In the bathroom, you will find our largest antique claw-foot tub with shower. Air conditioning, iron and ironing board, hair dryer and bath amenity collection. 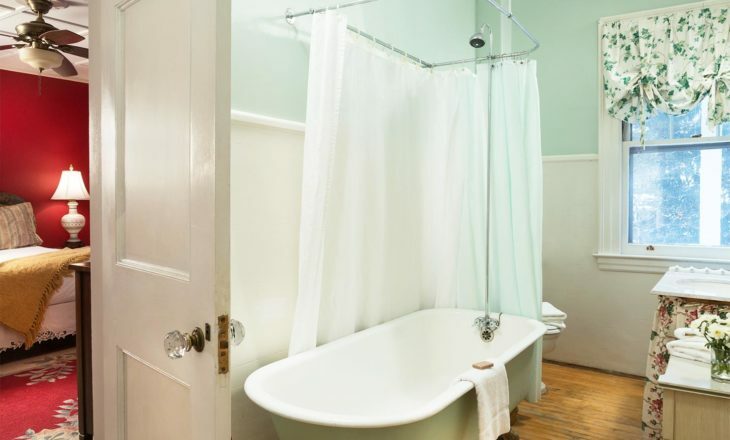 This room has a traditional claw foot bath tub with a shower and a wrap around shower curtain. There are no grab bars and you have to step up into the bathtub. This room is not good for people with restricted mobility. Captain Robert Shaw Oliver of Albany, and his wife Marion, constructed their home on this site in 1873 (replaced in 1896 by the Struthers’ “Wynnstay”). 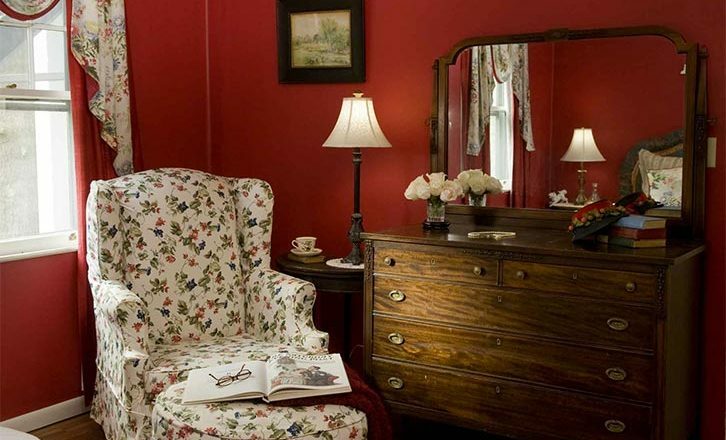 This room overlooks the site of the former “Bel Air” mansion, the home where Mrs. Oliver grew up. Unfortunately, Bel Air was destroyed by fire a century later. 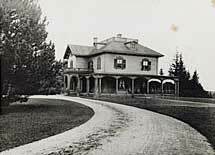 She was the niece of the Haggertys, the original owners of Ventfort Hall, which was moved across the street and renamed Bel Air when the Morgans constructed the current Ventfort Hall. Marion was also the daughter of William Rathbone, who constructed the first Wyndhurst mansion, now Cranwell Resort. "What wonderful innkeepers you are! Our visit at your Hampton Terrace last weekend was most delightful and the breakfasts were outstanding and most delicious. Thank you for your most courteous attention and I enjoyed hearing your stories, Stan. Do write them down for the children."